EPRUI Biotech Co. Ltd. offers a new generation of reversed phase polymer HPLC packing material. Our polymer chromatography column packing material is made of highly crosslinked monodisperse polymer resins including highly crosslinked polystyrene divinylbenzen, polymethyl methacrylate, copolymers of PS/DVB and PMMA. With precise control of particle size, particle size distribution, specific surface area, pore size structure and surface functional groups, our monodisperse polymer HPLC packing material has great properties including high resolution and loading capacity, strong rigidity, acid and base resistant, low back pressure, long lifetime and low non-specific adsorption. Our polymer based reverse phase chromatography packings have been widely used in high performance liquid chromatography (HPLC) analysis, isolation and purification of organic compounds, proteins, polypeptides, nucleic acids, natural products and synthetic pharmaceuticals. 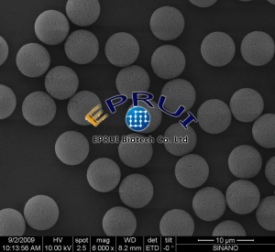 EPRUI supplies 2um nonporous polystyrene microspheres which is for UPLC application; 5um and 10um porous polystyrene microspheres for HPLC analysis use; 10um, 15um, 30um, 40um, 50um porous porous PS and PMMA microspheres for preparative chromatography use. 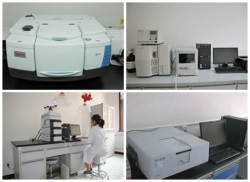 Pore sizes can be chosen from 100A, 300A, 500A, 1000A which can satisfy various biological purification requirements. Our monodisperse polymer microspheres have been successfully applied in the isolation and purification of plant extracts, antibiotics, polypeptides and others.